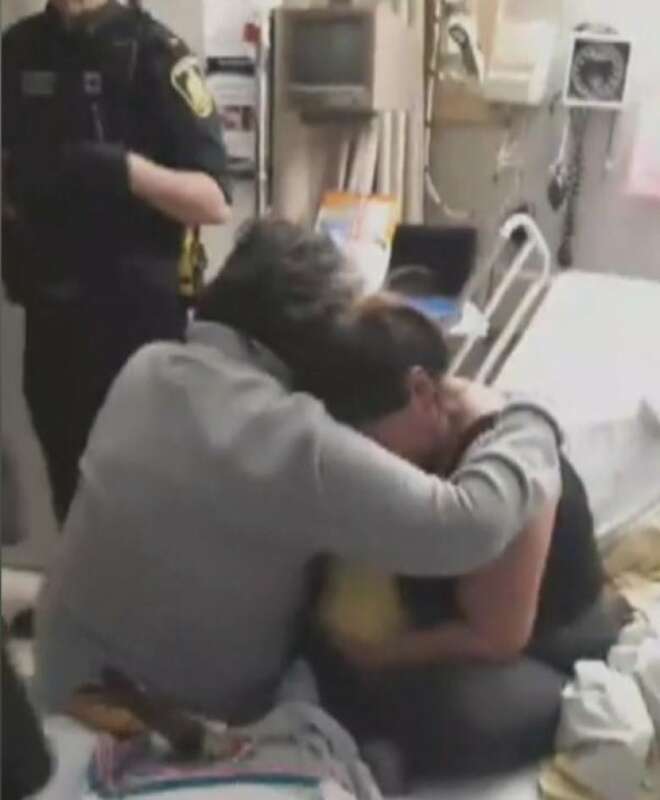 Staring down at her child's tiny hospital wristband, the mother of a newborn girl whose apprehension into care was streamed live on Facebook spoke out about her pain during an emotional press conference Friday morning. The mother, who can't be identified because her child is currently in care, said she was "blindsided" by the apprehension by Winnipeg Child and Family Services because she said she had made arrangements to have her aunt take over guardianship of her baby. "It's a huge letdown," she said. Her mother, 38, is living in Winnipeg, Ferris said. The man filming the video is her uncle. Another woman in the room is her aunt. Debbie Besant, CEO of the General CFS Authority, which oversees Winnipeg's Child and Family Services, said in an email that she had "personally" reviewed this file and met with the agency staff involved. "I am confident in the decisions made. We will continue to work with this family, and engage with any collateral or partner agencies the family wishes to involve," she said. "CFS phoned and said 'you take that down or you'll have a harder time getting your baby back'," said Morgan. "So they were threatened that they needed to take that video down." With a blanket reading "Bring our children home" behind her during Friday's press conference, the mother says she's still hopeful that she will be reunited with her child. "When I was holding my baby, she was keeping me content, strong, focused," the mother said. "I'm still hopeful things will work out in positive way." 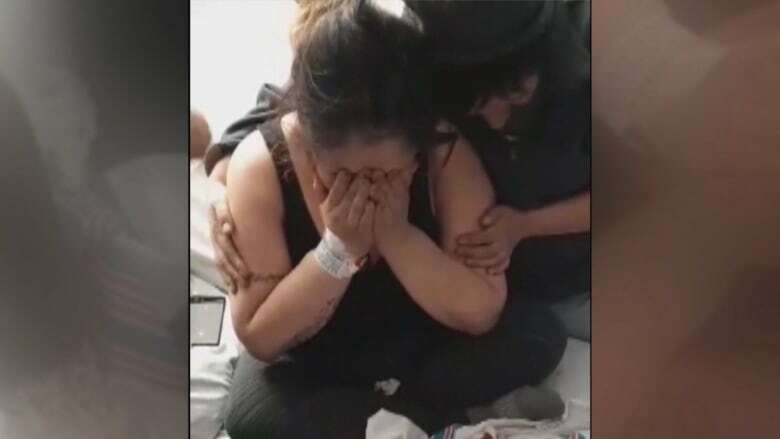 In the Facebook video, which the post says was filmed in a room at Winnipeg's St. Boniface Hospital, the baby girl is cradled by her mother, seated on a hospital bed and surrounded by sobbing family members. "I'll make it better for you," the crying mother said to her baby at the beginning of the video. "You deserved much better." As of 10 p.m. Friday, the Facebook video of the baby being seized had been seen roughly 559,000 times. Several of the newborn's family members spoke out about the incident at Friday's press conference. At times, the newborn's grandmother held up photos of her. "When I was trying to sleep, I would see her face," the new mom's aunt said at the morning news conference, a day after the baby was "apprehended," a term used by CFS. "I was so full of worries. Is she eating? Is she crying?" The mother's uncle, who took the video, held a pair of feathers in his hand tied together with beaded string as he spoke. He said the feathers were together just like he hoped his niece and her baby will be soon. "I know this," he said. Family members said they weren't angry with the individual social worker or police officers. The uncle said he even prayed for them "for doing a hard job like that." "Even these police, I could tell they were sad. They were just doing their job, too." Instead, they said they were going public with their experience to shed light on what they feel is a broken child welfare system in the province. Manitoba's child welfare system has been under scrutiny for years following several high-profile tragedies. A provincial spokesperson said 10,714 children were in care in Manitoba as of March 2018. According to a 2017/2018 annual report from the province's Department of Families, close to 90 per cent of those children are Indigenous. Last spring, the provincial government passed legislation to give the Manitoba Advocate for Children and Youth greater powers, allowing her to examine other services provided to youth in care, such as education, health and justice, and to publicly release the findings of her office's investigations. Still, several First Nations leaders spoke at Friday's press conference about how the video highlights what they say is a need for change. "They've hit the heart of the nation by doing this to a child and mother," said David McDougall, chief of St Theresa Point First Nation. He, too, said the blame should not be with the social workers, but with the province. "The real change that's about to happen is on Broadway," he said, referring to the Manitoba Legislature. "They need to give us proper time of day so we can decide what works for our people." 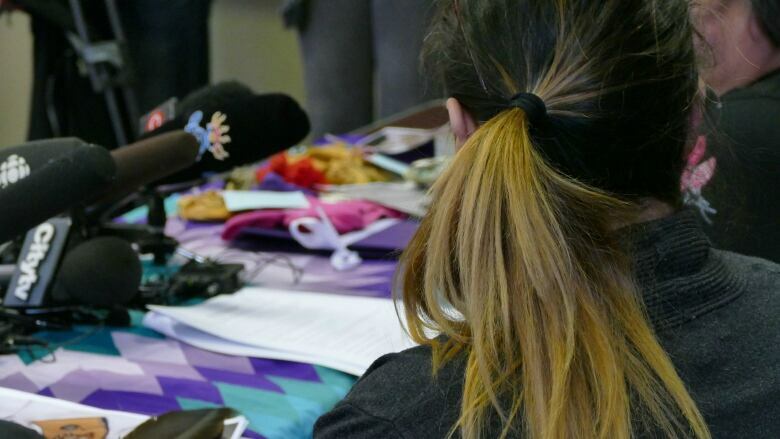 As of Friday afternoon, the baby is not back with the family, according to the First Nations Family Advocate Office at the Assembly of Manitoba Chiefs. Const. Tammy Skrabek of Winnipeg police said officers are sometimes called to assist CFS workers with apprehensions of newborns and young children. She said the family knew the baby would be taken ahead of time. The baby was taken in the care of CFS to another area of the hospital, she said. A spokesperson for the Manitoba Advocate for Children and Youth said the office is aware of the incident and reviewing the video. Federal Indigenous Services Minister Jane Philpott has also weighed in, saying the video showing social workers taking the newborn baby is "disturbing," and that her office is looking into it. Philpott said that while she doesn't know the details, she questions whether the bond between parent and child was given enough consideration. "Ideally, this should not be the way that families should have to get their concerns raised," she said. "It's really unfortunate that it takes something like this."